Glastonbury is a wonderful place to come and stay with its array of sacred sites including Glastonbury Tor, Chalice Well and Glastonbury Abbey. There are many major events, such as the Glastonbury Festival, Glastonbury Carnival, Goddess Conference, Crop Circle Conference and Megalithomania. 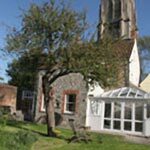 Glastonbury has an excellent choice of hotels, bed & breakfast accommodation, retreat centres, self catering and camping. We would be grateful if you let our advertisers know that you have found them through The Oracle website. A magical, mystical space in a tranquil location with stunning views of the Tor and meadows. Walking distance of Chalice Well, Tor, Abbey, High Street.